The standard ME 61C layout consists of three lower deck staterooms and two heads featuring granite counters, china sinks and teak-framed shower doors. The master stateroom features a king-sized bed, double bureaus and his and hers heads. The hanging lockers are cedar-lined and provide ample storage. The washer and dryer are concealed in a fully finished locker with louvered doors to match the hanging lockers. The VIP stateroom has a queen-sized island berth and a head which features the Marlow Explorer signature curved Lexan shower door, mirrored ceilings for space enhancement and Grohe Infinity fixtures. The port-side office/stateroom has unique double-panel doors that can be opened for a large foyer/lounge area or can be closed for complete privacy. The large protected aft deck leads to an airy saloon with all the amenities for gracious entertaining. 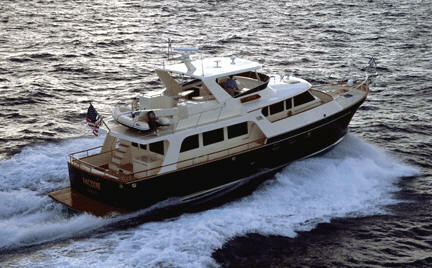 Three steps lead up to a gourmet galley, a plush dinette with seating for six and a full helm station. The pilothouse is large, open and provides great visibility whether you are running the boat from the lower helm or enjoying a meal. This is truly dining with a view!